Return to the world of Sons of Anarchy in Kurt Sutter’s new FX drama Mayans M.C.. There’s another gang of outlaw bikers, the all Latin motorcycle club the Mayans. 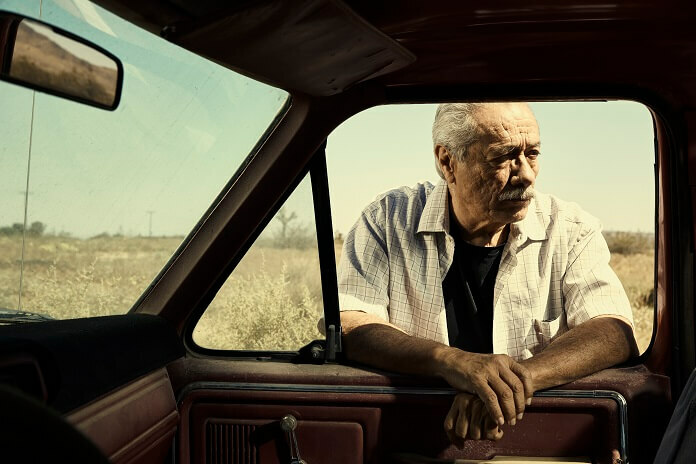 Edward James Olmos plays Felipe Reyes, father of EZ Reyes (JD Pardo). Olmos spoke with reporters after the TCA panel for Mayans MC. Always outspoken about real world issues, Olmos related the biker show to representation for Latinos and spoke about some of his own social initiatives too. Mayans M.C. premieres September 4, 2018 at 10pm ET/PT on FX. Do you get to ride on Mayans M.C.? Edward James Olmos: “No, no, I would not ride. I quit riding when I was around 24, 25 when I had my first kid. Not that I’m not a good rider. I rode very well on a 650 Norton and some nice bikes. I never had a Harley or anything that big. It just is too dangerous. It’s not even me, the driver of the motorcycle, as much as people didn’t see them. So constantly, every day, on the radio I hear, ‘Bike down.’ Every day. There’s always a bike down. ‘Bike down on the 405. Bike down on the 5. Bike down on the 10.’ People hit them. You’ve done a lot of television in your career, but Kurt Sutter is not your average showrunner. What is that experience like with him? 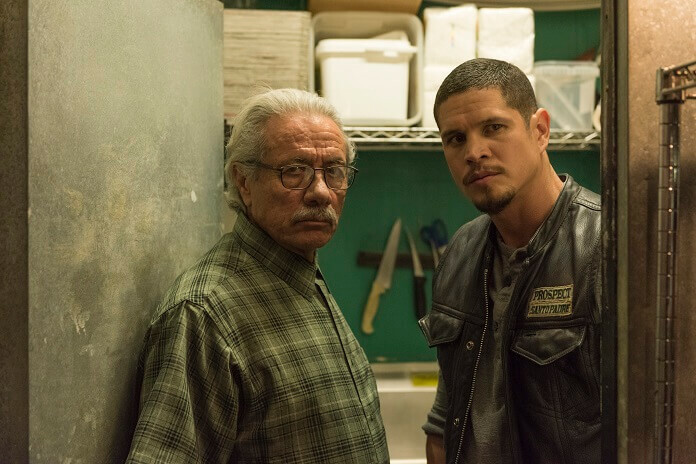 Do you see a lot of comparison between Mayans M.C. and American Me? How do you think roles for Latinos have evolved since you did The Family on PBS? Edward James Olmos: “Well, they haven’t. We’re still so unbelievably underrepresented. It’s 2018. It’s going to be like this I think until I guess maybe… maybe this. I think this will be very successful and that success will breed others. The same thing happened in the African-American experience in the ‘70s. It just like took off and they started to make more and more, and they all worked, especially in comedy. Are you filming in Boyle Heights? What do you think about the gentrification there? Edward James Olmos: “Whenever you displace people who can’t really afford to get displaced, it’s really not good. It’s like Chavez Ravine is not good. I don’t care how beautiful Dodger Stadium is and all that. Too many people are just displaced and never got what they needed to ever get back. They say it brings more jobs. Have you been doing activism to fight the immigration policies of this administration? Edward James Olmos: “Yeah, of course. Basically, any time that we can use our name to help bring awareness to any of the issues. It’s really difficult. The only positive thing about all of this is that it will change. It’s going to change. The change is going to be brutal. There will be a very difficult moment in time when this changes because this kind of change brings revolution. There will be people that will be physically angry and become militant. Are there any specific charities you work with? Edward James Olmos: “Right now, I’ve been working so hard on the Youth Cinema Project. It’s been very, very productive. That’s where change is going to come. If you haven’t been able to understand what that is, the Youth Cinema Project, go online and check it out. There’s over 1,200 students from fourth grade up who are in it all the way through high school in 16 different school districts in the state of California. Last year we made 128 films. We’re the biggest production house of filmmakers in the country. One group. Youth Cinema Project, you can’t beat it. They want it in Arizona, Texas, Georgia, Florida and New York. We will get there inevitably but we just are not going to lessen the quality of what we do. We send in two teachers, mentors to go into the classroom, 90 minutes during the class day. Not during an afterschool special. It’s from the first day all the way through the final day of school. It changes their whole perspective on schools.